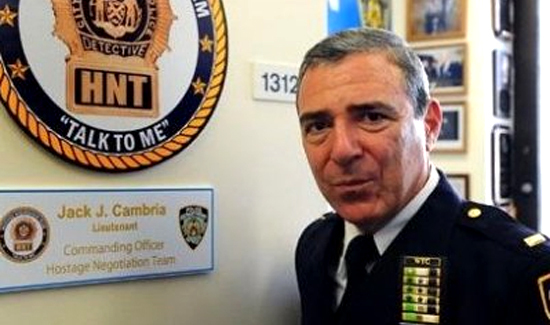 The NYPD has lost a legend, but no one deserves a well-earned retirement more than Lt. Jack Cambria. Cambria attained his impressive skill set through experience. On his first day on the job, he found himself trading hard stares with just about everyone he encountered while on patrol in Brooklyn. On his second day, he tried a different approach. Instead of staring, he simply said, “Good morning.” “Good morning, officer,” was the reply from just about everyone. How one treats people, after all, has a lot do with how they get treated. Over an amazing 14 years as chief negotiator for the NYPD, Cambria became a model for police negotiators nationwide and even abroad. Cambria’s seen it all. In 2011 when two bandits rushed into a Brooklyn liquor store and took three people hostage, downed $2,500 cognac and staged a four-hour standoff, Cambria said he asked an NYPD Emergency Service Unit supervisor to do something that would seem crazy to most people. “We told the other guy, ‘We treated your friend like a gentlemen—you saw that—and now we’re going to treat you the same way.’ And ultimately, he surrendered,” Cambria said. Cambria’s advice for police negotiators is to treat everyone with respect. Cambria contributed 33 years of exemplary service. He has served for 16 years in the Emergency Service Unit (ESU), whose primary focus is to provide rescue, SWAT, and counter-terrorism services to the City of New York. He was assigned to ESU where he worked as an officer, a sergeant and lieutenant—his current rank. He has extensive experience and certifications and is a New York State certified police instructor. He holds numerous awards for bravery and dedicated service. He has responded to and served on many high-profile assignments such as both World Trade Center disasters, plane crashes, and a variety of hostage and barricade situations, particularly with violent and suicidal individuals. He also served as the Rescue Team Manager of the FEMA-Urban Search and Rescue Task Force. He is frequently called upon to lecture all over the country and share his expertise. After 33 years on the job, Cambria is retiring—as a legend.